On the previously mentioned subject of "naked sushi", a Japanese restaurant in the conservative Chinese city of Kunming has gotten in a bit of trouble from offering a promotional "feast on a beauty's body" for local journalists. 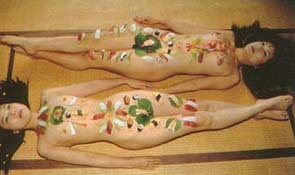 Known as "Nyotai Mori" in Japan, the feasts date back to ancient times and are often offered in special hotspring resorts today, but are generally left off menus. They are offered to aficionados on request. Yeah, maybe its wiser to leave it off the menu, if the local community doesn't exactly love the idea. Not that it is any of their business. Anyway, here's a French page that explains in quite some detail how it is done correctly. You need a virgin, for one thing. ...you also have to warn about suspect sushis below the navel line, I'm told. You've gotta be careful with those chopsticks. 8 Apr 2004 @ 22:41 by skookum : OUCH! Feast on a beauty's body! Be humble, Be kind, it costs us nothing to be a good Samaritan.